Up until the last century or so, and still in some places around the world, people birth surrounded and supported by knowledgeable and compassionate members of their community as their primary birth support. There is a belief that when one feels safe and is encouraged to trust their body and self, the labour process is positively affected. A doula enters that old tradition. In essence, a doula is a birth companion. Whatever your desires, your goals, how your birth unfolds, your doula is with you; she has helped you mentally, emotionally and physically prepare. On the day of your wee one's arrival, she continues to support you, emotionally, physically, in your decision making. She stays with you every step of the way of your baby's arrival. She only takes her leave once you have both eaten, are settled and ready for a good rest. Doula comes from an old greek word which means slave - she is whatever you need her to be, she does whatever you need her to do to help you courageously engage with your own labour. The specific actions of a doula is hard to pin down, as she configures her support to fit what you need and continuously shifts as your needs transform throughout labour. 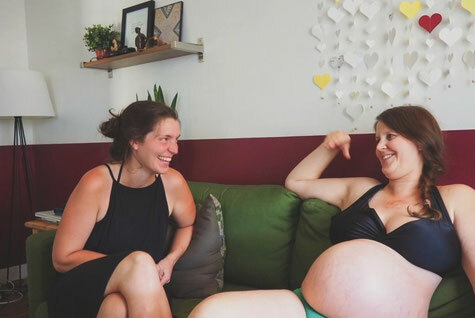 One doula may offer the exact opposite support in one birth from another, because it is all about the person giving birth. A doula parks what she personally would like at the door, and works her magic to know what will be perfect for you to help you stay strong and positively interact with each contraction. Kate is familiar with the process of birth, both at home and hospital. She knows that birth is not only hard work and hushed tones. Sometimes it's fun. Labour contains moments of laughter and shared stories, an opportunity to not only pass the time and help you ignore those early contractions, or to bring ease to the sudden quiet of a slowed contraction rhythm but also to remind your heart and body that this is good. You are enough, you can do this, you can birth well. If the road feels long and your steps become uncertain, Kate helps you slow down the moment so you can refocus, find your breath and rhythm again. Does a doula help with pain? Labour is not a corner your body accidentally backed itself into. Just as your body made way for a life to be conceived, and grown, sometimes even without our knowledge, it knows how to let go and let your baby come out. It is a good process, but it can still hurt. Most pain we experience is there to tell us something is wrong, something is wounded. When your body opens to birth your baby, your muscles work hard, and your body stretches in ways it has likely never released before. Your doula helps you interact with the sensations you experience in many ways, like reminding you that though it is intense, it is not bad. You are not in danger, and this is well within your body's ability. It can be trusted, and your body is completely capable to stay in it. A doula doesn't just remind you that labour is not beyond you, she also helps you find relief in simple and effective ways. Movement and breath can be powerful factors in helping your body open and your baby descend, and a doula can remind you to flow with what your body is doing, and when a new position could assist in the process. Massage and physical touch also alters how we interpret physical pain, and your doula is familiar with which areas of our bodies often benefit from extra support. Keeping your body loose and free of tension helps make the way for things to open, and when your body isn't fighting against itself, things often feel much more manageable.